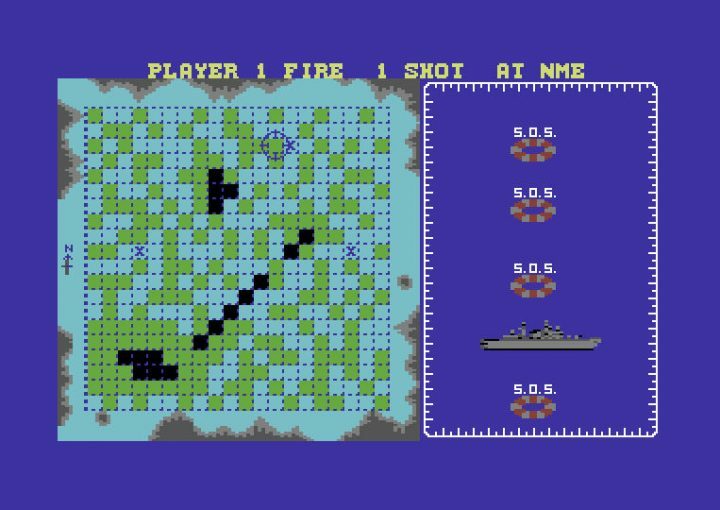 We enjoyed our recent experience of Battleships on the ZX81 so much that we decided we’d see if there was any more fun to be had playing it on the Commodore 64. 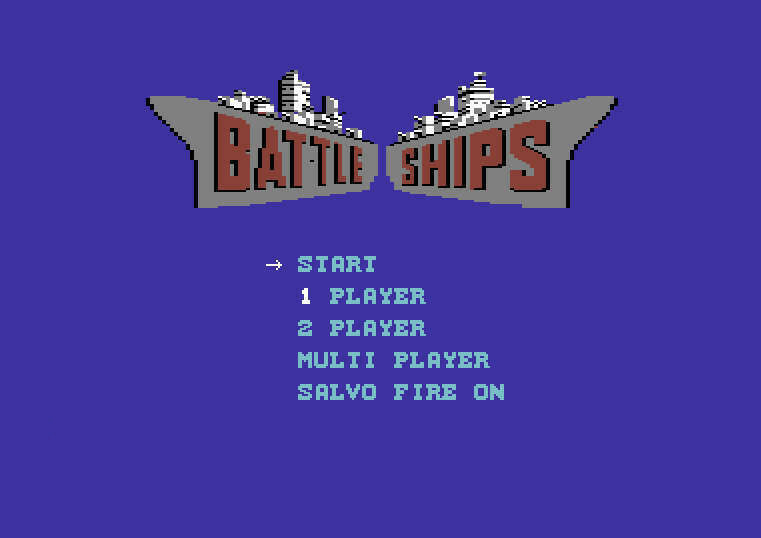 ‘BATTLE SHIPS’ was released by Elite in 1987 and was a computer game version of the well known graph paper and pencil based game that covertly whiled away many a boring maths lesson. 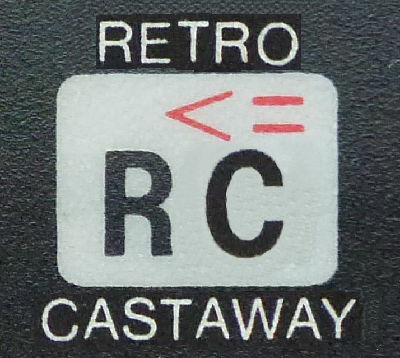 It could be played 1 or 2 player and was released for the Commodore 64, Spectrum, Amstrad CPC, BBC and Amiga. We’re playing the C64 version here. It’s a turn based strategy affair but unlike the classic rules of the game this version lets you take as many shots as your fleet can muster at each turn. This works by presenting you with the vast grid of coordinates and letting you place your available shots. The game then switches to an animation showing your shots being fired whilst you are harangued by a swarm of enemy fighter-bombers. You can’t shoot at these enemy planes and despite repeated attacks they always miss when trying to bomb you, they’re just there to add to the ambience. To the side of the animation is a graphical representation of all the enemy’s ships, if you hit one you get a satisfying plume of flames funnelling out of the ship you hit. Once all this is done your enemy has their chance to rain down fire on your ships. 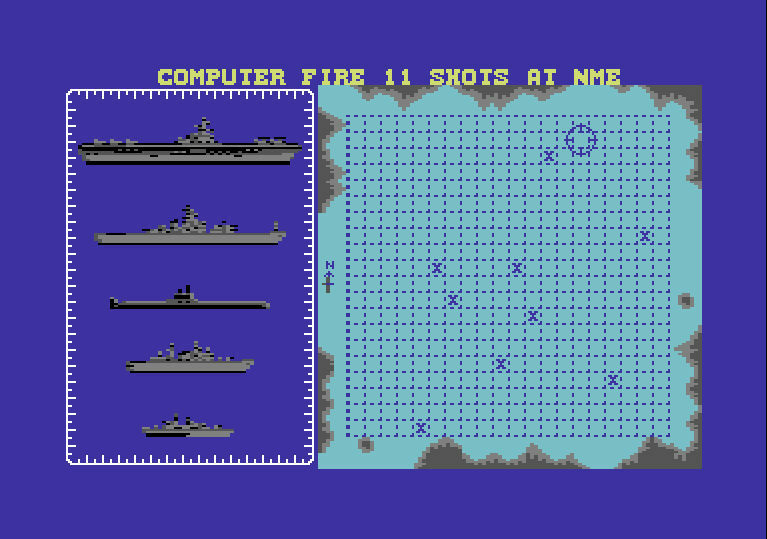 As ships are sunk the fleet that suffered the loss will have less firepower and therefore less crosses to lay down in the grid for their turn. The game ends when one of the fleets is completely destroyed. The last enemy ship is proving elusive (or the computer is cheating and moving it about). 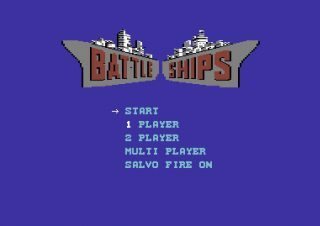 It pretty much just sticks to the basics of Battleships and it does a good job of it. When you’re desperately hunting down that last enemy ship and finally one of your speculative shots in the dark hits home there is a genuine feeling of satisfaction and reward. 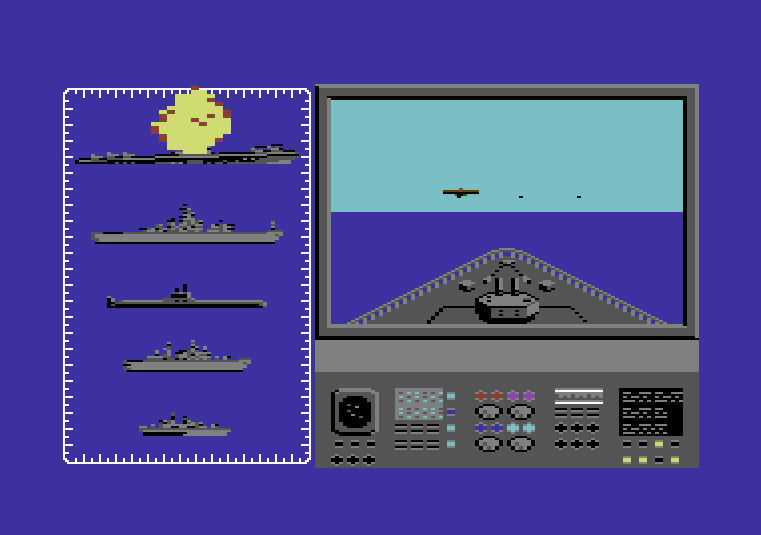 It’s definitely worth a few games and the animation and sound effects mean you need to leave less to the imagination than the ZX81 version of battleships we typed in the other day. A special mention has to be made to the theme music that plays on the title screen which is a C64 SID classic. It starts with some sonar pinging and underwater sound effects before an 8-bit rhythm joins the fray followed by the full rousing melody. It’s a bit like a cross between early Depeche Mode and the Star Wars theme which if your finding difficult to conjure up in your minds ear then you’ll just have to take our word for it. for a couple of quid or so.